His good manners aside, Cliff Swain seldom spares his opponents. CLIFF SWAIN and Michael Jordan have a lot in common, though perhaps not at first glance. Swain is, after all, a South Boston Yankee with a full head of black hair; at 5 ft. 11 in. he's a good seven inches shorter than Jordan; and he's virtually unknown outside racquetball circles. But Swain dominates professional racquetball as much as Jordan ever did basketball, and there are plenty of other parallels to suggest that Swain goes further than merely wanting to "be like Mike." Swain, 28, is his sport's best player and arguably its greatest ever. Certainly no one has achieved a record like the one Swain amassed in the recently concluded 1993-94 pro racquetball season, winning 13 of the 19 International Racquetball Tour stops, with two streaks of five tournament victories in a row. Swain was especially daunting over two weekends in December. First he took the Coca-Cola Pro Am in Denver by winning four matches without a loss. (Pro matches consist of the best three of five 11-point games.) It was only the second time in the sport's history that a player had won a pro stop without losing a single game; Swain himself was the first to do it, in 1989. The next week Swain went 15-0 over five matches to win the VCI Pro Am Championships in Dallas. And with a win in Anaheim in March, he clinched the season No. 1 ranking for the third time in his career, equaling Jordan as a three-time pro champion. But don't expect Swain to jump to another sport now that he's won a third title. He has already taken a couple of years off from racquetball to sample another sport. After sealing his first No. 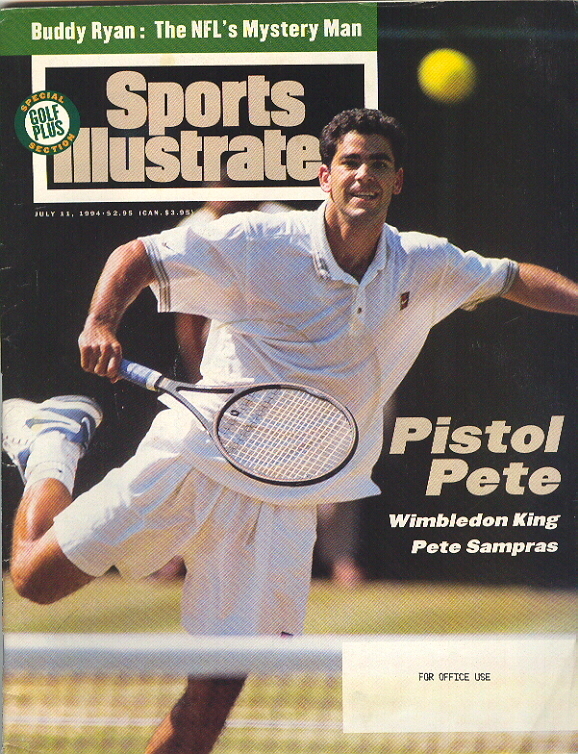 1 ranking, in 1989-90, he sat out two racquetball seasons for a go at pro tennis. What made Swain quit racquetball for a shot at tennis? Partly it was the lure of so many more spectators, and partly it was the unusual encouragement he received at his local club in 1990. Boris Becker and his coach at the time, Ion Tiriac, showed up at the Boston Athletic Club one day with Tiriac's teenage son in tow. Swain obliged the kid with a game of tennis, and soon Tiriac and Becker had stopped hitting to watch Swain. "Tiriac asked me how long I'd been playing," says Swain. "I told him I didn't know -- maybe 15, 20 times. He said I would get good fast and that I should give it a try. I figured while I was young enough, I would give it a try." Swain returned to racquetball for the 1992-93 season, having decided it was more fulfilling to be the absolute best at one sport than to be a late-starting nonchampion at another. He finished the season with his second No. 1 ranking. But he didn't give up other sports entirely. Every chance he gets, Swain still plays hockey with a passion rivaling Jordan's for golf. 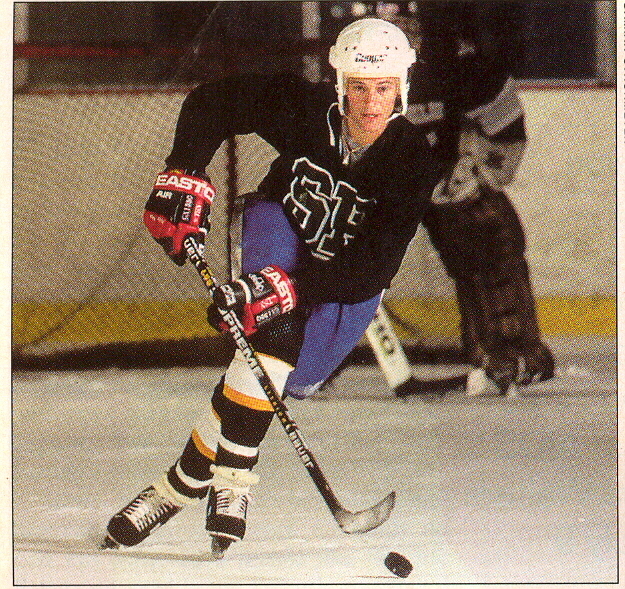 Swain plays most of his hockey in American Amateur Hockey Association "noncontact" games around Boston. In May he showed up for a tournament in Acton, Mass., having forgotten his shoulder pads; he played anyway and scored two goals in his team's 8-0 win. He even got into a brief altercation in the goal crease with an opposing defenseman who forgot he was in a noncontact league and fattened Cliff's lip with a cross-check. News of the bruise did not sit well with Cliff's father, Red Swain. "I hate it," says Red, a bindery supervisor at a Boston printing company. "I say, `Cliff, I like you to enjoy yourself, but you're playing with your rent.' "
Cliff understands his dad's logic but plays hockey anyway. "Sometimes," he says, "it's not fun to do the smart thing." Fun has always meant sports to Swain. Red bought Cliff his first Whiffle bat when he was three, and neighbors used to gather to watch the little boy take his cuts. Red believes to this day that baseball could have been Cliff's best sport, but that was not all that Cliff was good at. At four he was beating kids twice his age at swim meets near the family's apartment in San Jose. When he was six, his family moved to Braintree, Mass., near Boston, and hockey was Cliff's sport from then until he took up racquetball at 13. Red also helped introduce Cliff to racquetball, albeit accidentally. One summer day in 1979 he took Cliff to watch Red play handball at South Boston's beachside L Street Bath House. A friend of an uncle of Cliff's was also there that afternoon, waiting for a racquetball partner who hadn't shown up. Cliff had never played racquetball, but the man knew that Cliff was gifted enough athletically to give him a decent game, and so he talked the 13-year-old into filling in. Despite the man's advantage in strength and experience, Cliff won the first match of his life. Next Cliff defeated one of the state's best junior racquetball players in an impromptu match, and by the following March, Cliff was officially Massachusetts' new junior champ. A year later, in March 1981, he repeated his win in the junior tournament and won the men's open, too. Swain was still four years away from turning pro. There didn't seem to be much point, once he began picking up $500 and $1,000 checks for winning local tournaments. Anyway, his father didn't think he was ready to join the tour. 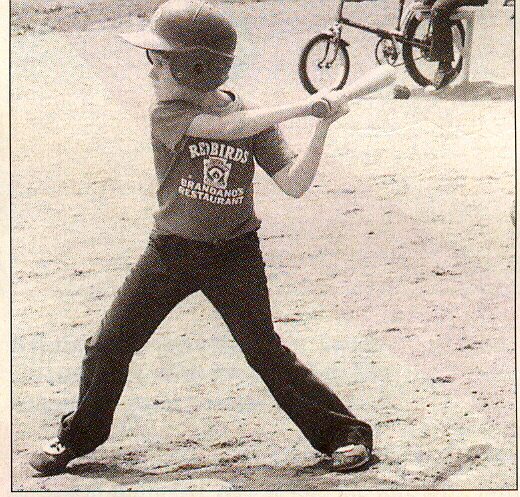 That changed at a tournament in New Hampshire in 1985. Cliff, then a few months shy of his 19th birthday, got angry with an opponent for being rude to another player. "So he destroyed him," says Red. "The guy was a state champ from some other state, a lefty like Cliff but bigger, stronger, older. Cliff beat him 15-0." Won over by the performance in New Hampshire, Red let his son enter the 1985 Tulsa Pro Am that February, and Cliff beat four of the sport's top 10 players and became the only unseeded player in history to win a racquetball pro stop. That May in Los Angeles, Swain beat racquetball legend Marty Hogan in the quarterfinals, No. 1-seeded Dave Peck in the semis and Peck's brother, Gregg, in the final to win the biggest event of that season, the Ektelon Nationals. He dropped out of Providence College that fall to join the pro tour full-time, figuring he could always return to school later. (He's taking courses in business and Spanish this summer at the University of Massachusetts-Boston.) Except for the two years off to play tennis, Swain has ranked among racquetball's top five players ever since. Swain's low-six-figure earnings include endorsement money from Head Sports and Leader Sport Products. And, like Jordan, Swain has dabbled in the restaurant business, though much less successfully -- he has already pulled out of his partnership in a coffee shop down the block from his South Boston brownstone. Swain shares Jordan's intense competitiveness and hatred of losing. Helping to keep him motivated at tournaments, he says, are the postvictory calls home on Sunday nights to his parents and his girlfriend, Lee Doyle, a nurse. But the routine has a potential downside, too. "Boy, do I dread my call home if I lose," he says. "I don't even make it sometimes. It's kind of cowardly of me, but I don't." Few athletes take losing harder than Swain. "I don't sleep for two, three days when I lose," he says. "I nod off here and there, but sleeping is very hard. I don't enjoy eating -- I don't enjoy anything after a loss. Until another win." Sleeping hasn't been much of a problem for Swain this year, and his on-court brilliance has been beneficial to the pro tour as well. But his off-the-court demeanor is also an asset to his largely neglected sport. Swain makes it a point to stick around for a day or two in the host city after each pro stop and writes thank-you notes to tournament sponsors. Which brings up a final point of comparison with Jordan. Pro racquetball players are stronger and better than they've ever been -- Swain's serve, for example, has been clocked at as fast as 192 mph -- and if racquetball as a participatory sport seems to be on the wane, the reverse is true for the pro game. Next season's schedule, beginning the second week in August, nearly doubles the number of tournaments to 35. A superstar with a great attitude helps popularize pro racquetball -- much the way Jordan and, before him, Magic Johnson and Larry Bird helped basketball prosper. Not that Swain himself thinks he's doing anything that special off the court, mind you. "I just want to be the absolute, 100-percent best that I can be," he says, "so that when it's all said and done, I can say, `This is what I was great at, and I did the best I could with it.' I mean, even if it wasn't sports, you get one shot at life, and you want to make the best of it." Jordan couldn't have put it better.